Does Experience Really Matter In Colorado Criminal Cases? Colorado Traffic Stops and Questioning – Do You Have To Answer Colorado Police Questions? Colorado Bail Bond Revocation Laws – Can They Revoke My Bond Like That? 6 Things to Consider in Hiring A Colorado Criminal Defense Attorney. The Charging Decision and Control Of The Case – Who Really Controls The Course Of Colorado Criminal Cases? Can I Use Self Defense In Colorado Obstruction, Resisting Arrest and Second Degree Assault On A Police Officer Cases? Colorado Criminal Defense Tactics – Should I Choose A Judge Trial Or A Jury Trial? Colorado Criminal Law – What Should I Expect Of My Colorado Criminal Defense Lawyer? Colorado Criminal Restitution Law – A Continuing Right To Increase The Amount? Colorado Criminal Law – How Do I Get A Continuance Of My Colorado Criminal Trial? Colorado Misdemeanor and Felony Sentencing Laws – What Is My Sentence Going To Be? Will I Get Probation In My Colorado Criminal Case? A Denver Colorado Criminal Lawyer Asks – Can The DA Stop The Witnesses From Talking To The Defense? Colorado Sentencing Hearings – Colorado Criminal Tactics – What Happens At A Sentencing Hearing? Colorado Criminal Law – Patient – Psychologist Confidentiality – What If The Patient Makes A Threat? Colorado Criminal Lawyer Series – When Can You NOT Trust Your Lawyer? Road Rage And Aggressive Driving Crimes In Colorado – What Is It? How Is It Charged? Forensic Searches Of Computers In Colorado How Long Can The Search Take? 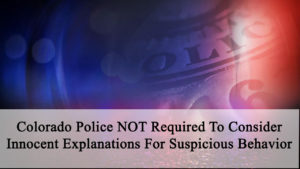 Colorado Police NOT Required To Consider Innocent Explanations For Suspicious Behavior – It is a common belief that the police must give you the benefit of the doubt when they are investigating when they suspect is a possible criminal act. That common belief is wrong. What if there are “innocent explanations” for otherwise suspicious behavior that is observed by the police or conveyed to them by other sources? And if there are, do the police have to consider these possible “innocent explanations” behavior before conducting the investigatory stop. The Colorado Courts of Appeal and the United States Supreme Court do not require an officer to consider every possible innocent explanation for criminal behavior. …driving around late at night, going in and out of unfinished houses in an area where there had been recent break-ins of unfinished houses, and carrying a black bag. In this case (Colorado Reyes Case ) there were, as the lower court found, “innocent explanations” for the suspect’s behavior that were consistent with the construction of new homes. The Defendant moved to suppress incriminating evidence discovered as a result of the investigatory stop conducted in that case. Quick note: Under Colorado law, the “fruits”” of a constitutionally unlawful investigatory stop must be suppressed and cannot be used against the accused. In the Reyes case the Defendant argued that the police officers did not have a reasonable, articulable suspicion for initially stopping and talking to him. (4) the caller saw that person leave one of the houses with a black bag and a get into the van. Reyes-Valenzuela based his argument partially on the fact that contractors sometimes worked late at night on the unfinished houses. Under these facts the Court held – on appeal – that police were not required to consider the possible innocent reasons for his entry of several unfinished houses late at night. 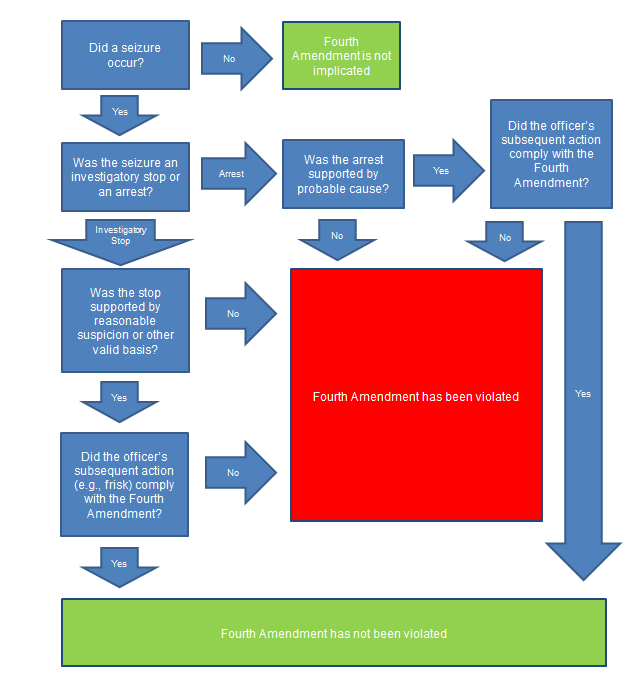 A Colorado law enforcement officer’s investigatory stop must comply with the Fourth Amendment. To answer this question, Judges are mandated to look at the “totality of the circumstances.” The analysis requires a review of the facts from an objective standard – and not the subjective intent of the officer. The fact that innocent explanations may be imagined does not defeat a probable cause showing. Instead, the police are entitled to draw appropriate inferences from circumstantial evidence, even though such evidence might also support other inferences. 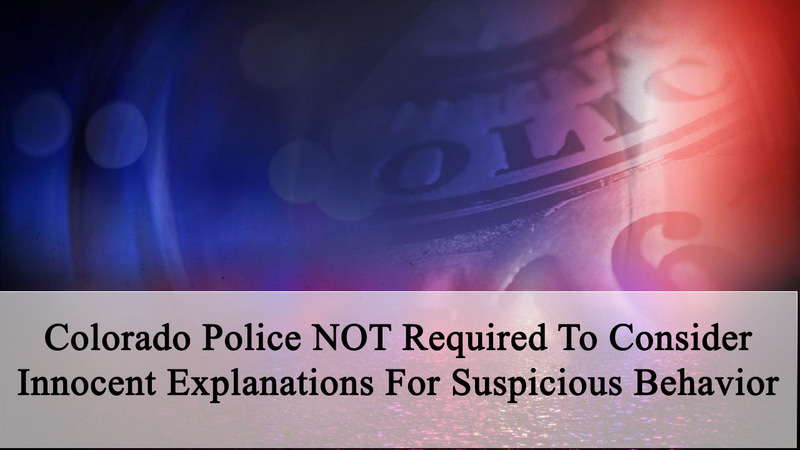 Bottom line – Colorado police officers are not required to consider innocent explanations for behavior that otherwise would support reasonable, articulable suspicion. The police are entitled to draw appropriate inferences from circumstantial evidence, even though such evidence might also support other “innocent” inferences. 1. Did a seizure occur? 2. If so and it was a stop, was it supported by reasonable suspicion or other valid basis? 3. If reasonable suspicion supported the stop, was the officer’s subsequent conduct sufficiently limited in scope? 4. If the seizure was an arrest, was it supported by probable cause? You should be careful to make a responsible choice in selecting a Colorado Criminal Defense Lawyer. We encourage you to “vet” our firm. 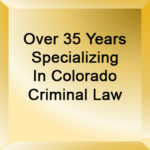 Over the last 30 plus years – by focusing ONLY on Colorado criminal law – H. Michael has had the necessary time to commit to the task of constantly updating himself on nearly every area of criminal law, to include Colorado criminal law and procedure and trial and courtroom practice. H. Michael works hard to get his clients the best possible results in and out of the courtroom. He has written, and continues to write, extensively on Colorado criminal law and he hopes this article helps you in some small way – Colorado Police NOT Required To Consider Innocent Explanations For Suspicious Behavior. Colorado Police NOT Required To Consider Innocent Explanations For Suspicious Behavior. It is a common belief that the police must give you the benefit of the doubt when they are investigating when they suspect is a possible criminal act. That common belief is wrong.